Oh, beer. I miss you. Or rather, I miss the idea of you (but IPAs, I do actually miss the drinking of you, a hell of a lot). But ever since I found out beer is chock full o’ gluten I’ve been gazing fondly at the Sierra Nevada, and lamenting the fact that I can never, truly, enjoy visiting Portland, Oregon again. Luckily in the ever-expanding world of gluten-free goodies, there are a few people out there making a valiant effort in the world of beer. Sorghum is usually the grain of choice, as you can see in this display at Whole Foods, which admittedly, made me a little giddy. 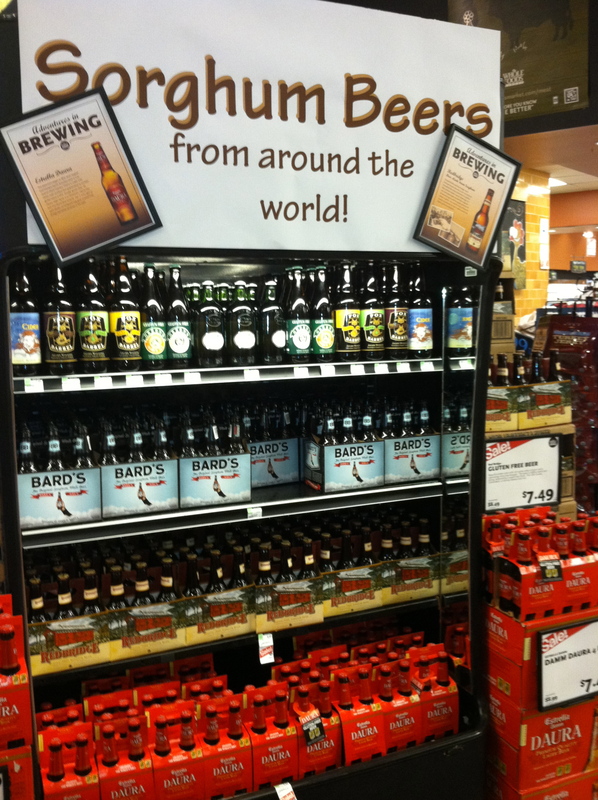 However, all beers are not created equal, and that goes for the healthy for celiac versions as well. In my expert opinion*, these are the tops. Da, da, da, da! This beer truly is the best gluten-free option. But I have to say I’m a little disappointed in my local booze purveyors, since I’ve only seen two options: the white beer, and the amber ale. Apparently there’s a whole Green’s party going on that I’m not privy to. Since my tastes do lean more in the bitter IPA range than the sweet white beers, I prefer the Amber and Dubbel Dark in the Green’s family (found the Dubbel Dark in Austin). These are the only gf beers I’ve found that really remind me of my bitter craft brew drinking days. They’re also big, which means I can buy one and be good for the night. YUM. Finally, an American entry! And from Milwaukee, no less. New Grist is one of those “I’m having a barbecue and want to have a six-pack in my fridge” kind of beers. Also, you won’t be embarrassed to give it to your gluten-loving beer-drinking friends. It’s a lot more full-bodied than your average American beer, and I can see this going into heavy rotation in our house. First of all “beer” and “Spain” don’t exactly go together like Fritos and chili, so I was skeptical when I tried the light and crisp gluten-free Daura . But the tag did tout their “world’s best gluten-free beer” award, so I had to check it out for myself. It was nice. Not my typical go-to, but if you’re a light beer drinker and you’ve got that celiac thang, this should be your pick up. Or should I just say, “Some other gluten-free beers I’ve tried, because there aren’t that many at my local Whole Foods.” Redbridge is passable if you need a beer with your nachos. Bard’s is a step-up as nacho-chaser. In fact, I’m thinking of re-visiting Bard’s based on someone else’s recommendations so perhaps it could rise on my ladder of lager. Now I’ve heard rumors that there is a gf IPA floating around somewhere, but I can’t find it in Los Angeles. Please, anyone, if you see it — let me know post-haste. *Credentials include, but are not limited to: Went to a state college, lived in Austin, Texas, worked in the music industry. Tags: gluten free beer, gluten free grocery shopping, whole foods. Bookmark the permalink. Unfortunately, at least for now these beers are only available in the Deschutes brew pubs. Cross our fingers that this will change in the neer future and they start distributing on the west coast. I am looking forward to taking my GF wife here in October so she can have a chance to order something besides a Redbridge in a restaurant. Bonus Sidenote: I’ve read they also serve cheeseburgers with GF buns. Portland always has to one-up everyone, doesn’t it? And now I totally have to go back to that magic wonderland. GF buns and cheeseburgers??? Holy crap. Thanks Dale! Oh yes I forgot to mention, yes we visited Deschutes last time we were up in Portland their GF menu and beer were awesome. I filled two growlers! I’m a Portland native and had my first Sorghum beer there, HOWEVA, we reside in Denver now and all I can find is http://newplanetbeer.com/homepage/ and it is DELISH! My husband prefers it and he doesn’t have gluten issues. Okay, then it’s official. I HAVE to move to Portland. Or Denver, that sounds awesome! It’s supposed to be great beer! If in Los Angeles, The Burger Kitchen on 3rd St and Crescent Heights has Green’s Dubbel Dark Ale. OMG it is really good. Not a beer drinker by nature and unable to have standard beer, I had a bottle of this tasty 7%er. Delicious. No way! And that’s not too far from my house. Thanks for the rad tip Kelly. My wife and I picked up all the choices available, except a blonde version – at Market of Choice in S. Eugene (OR). Gotta say the first one we shared was pretty good… thanks for your post. It was very helpful ! That’s great! I hope you find the beer you want. You’re a bit out of date here. A lot has changed since 2011. Mainly Harvester Brewing. They are a dedicated GF brewery in Portland. Their IPA is delicious. New Planet also has good beer too. Those two are pretty much all I drink. But soon I will start home brewing. Yeah, that’s when I wrote it. So feel free to share, but I did not rewrite this every time I tried a new beer. I’m a little busy. Omission has an IPA that is unbelievable. Nice and hoppy!! While I realize I a very fortunte to live in Portland I have to say that Harvester Brewing is the BEST. It trumps Deschutes, Omission (which gives me a reaction) and any other gf beer out there. They are a dedicated gf brewery and they are on tap at a number of local restaurants. But the best thing? They have a small gastropub that is completely gf as well. And they have three different IPAs. Just saw the post before mine after I posted. Not trying to be redundant; just trying to spread the gospel of Harvester. I’m so jealous of all of your Portland types. SO. Where can I find a bitter I PA with a good amount of alcohol like (ABC 6 %) or better range that is also Gluten free? Well, I love Omission’s IPA and I just had another one from Portland at a bar, but promptly forgot what it was called!!! I think it’s time I updated my beer list.